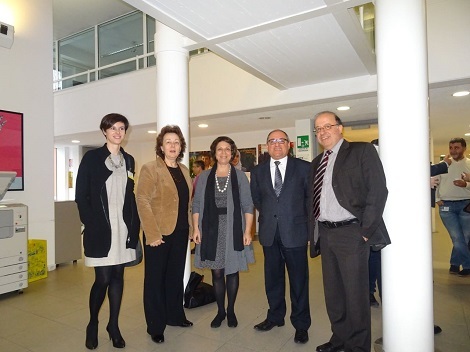 A Cedefop delegation headed by Director James Calleja took part in a knowledge-sharing seminar with the European Training Foundation (ETF), Cedefop's sister agency, in Turin on 13 February. Apprenticeships, validation and the next stage for European tools were on the agenda. Since 1997, Cedefop and ETF have developed a formal cooperation within the framework of their own specific missions and responsibilities. Knowledge-sharing events ensure exchange of information and experiences on key European Union and third countries policy issues of mutual interest which are of relevance to each agency’s mandate. At the latest seminar, Mr Calleja and ETF Director Madlen Serban discussed with experts from the two agencies their vision on future developments in response to vocational education and training and lifelong learning challenges. This was followed by presentations/discussions on thematic issues. Cedefop experts Ramona David, Ernesto Villalba and Loukas Zahilas presented the Centre's work on apprenticeships, validation and the next stage for European tools.